Moon was not sight­ed any­where in Britain or in our clos­est Mus­lim coun­try of Moroc­co. It was also not sight­ed in South Africa. 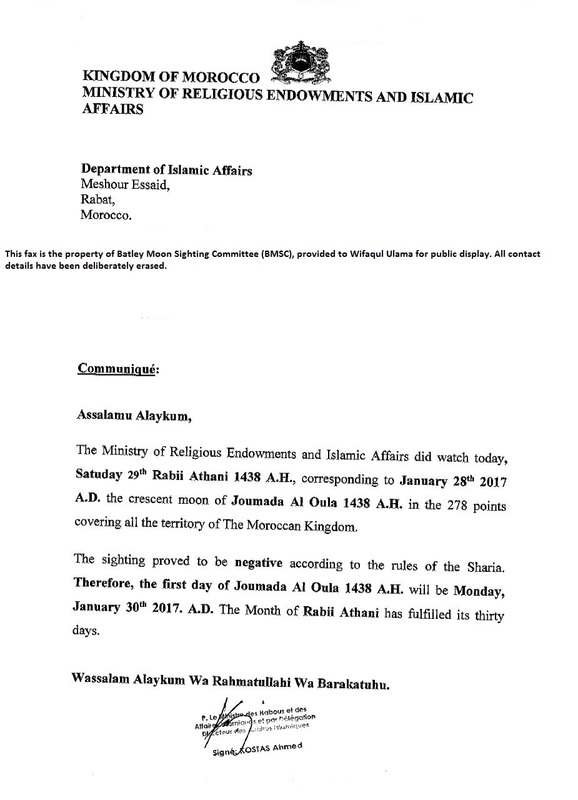 Wifaqul Ula­ma have there­fore decid­ed that 30 days of Dhul-Hij­jah will be com­plet­ed and Muhar­ram 1438 will begin from Mon­day, the 3rd of Octo­ber 2016. This Moon was observed at Bay­onne on the 02nd of Octo­ber (this for the record as it was not seen the day before). 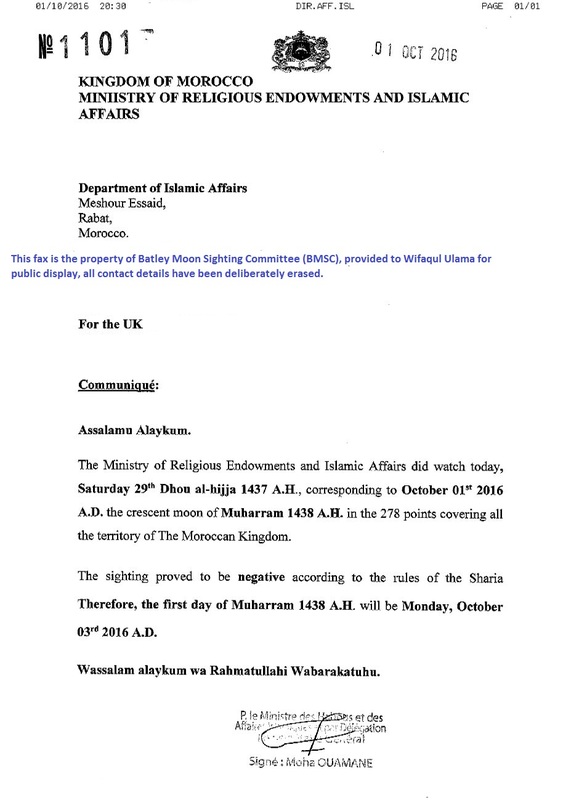 Wifaqul Ula­ma togeth­er and in con­sul­ta­tion with Bat­ley Moon Sight­ing Com­mit­tee make the deci­sion for the start of Islam­ic Months based on Moon­sight­ing in UK (pri­ma­ry) and Moroc­co (sec­ondary). 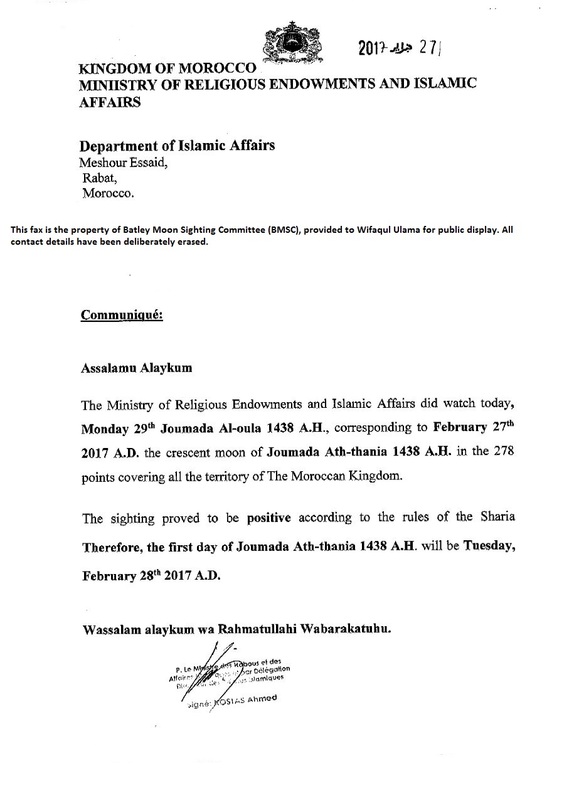 Please note that the deci­sion is not nec­es­sar­i­ly based on Moroc­co (month­ly). 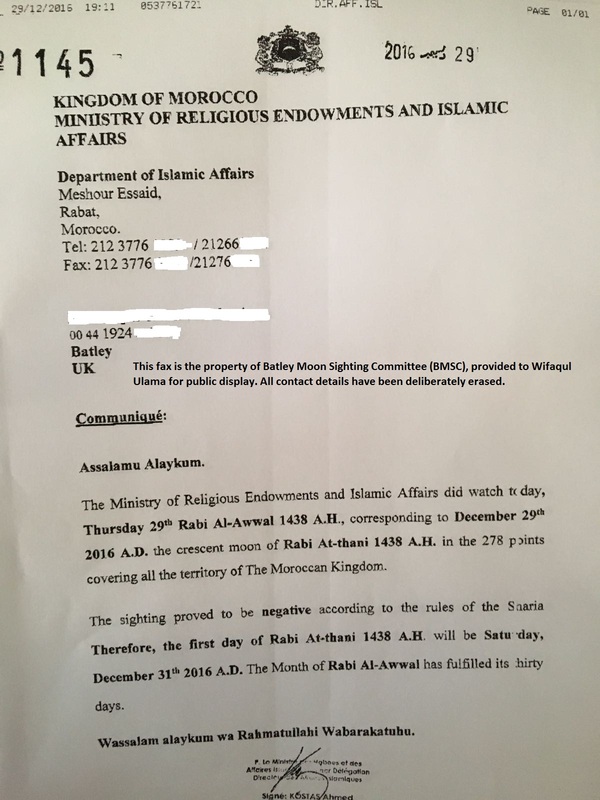 Depart­ment of Islam­ic Affairs offi­cial­ly noti­fies the British Ula­ma by fax month­ly and a copy of the fax for this month can be viewed here, pro­vid­ed as cour­tesy by Bat­ley Moon Sight­ing Com­mit­tee. 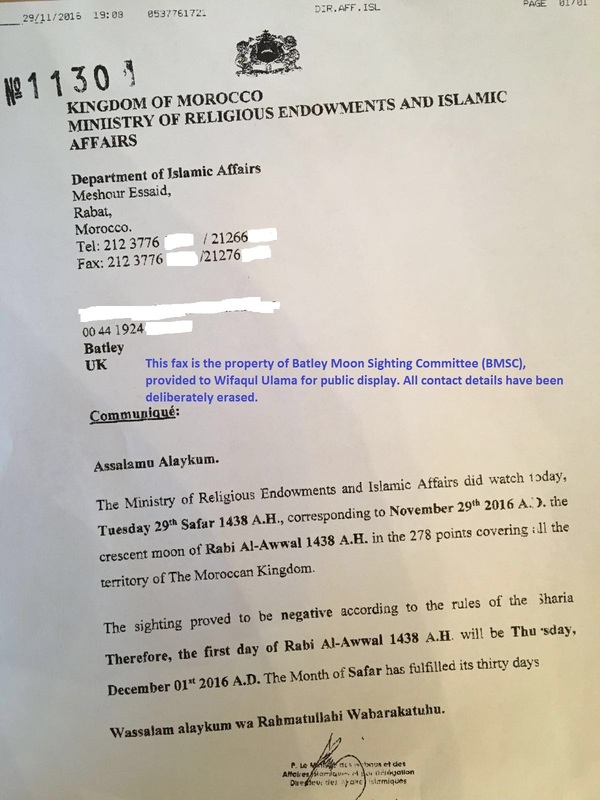 This fax was received in UK rough­ly 60 min­utes before sun­set in Britain due to neg­a­tive Moon­sight­ing which takes no longer because all sight­ing sta­tions have to report before a report can be sent. Moon was not sight­ed any­where in Britain. 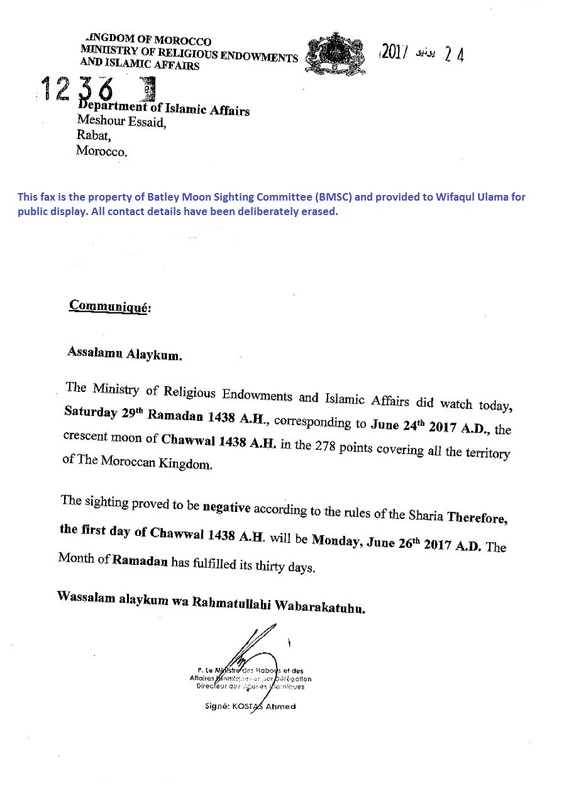 How­ev­er, we have received cred­i­ble and ver­i­fied news of Moon Sight­ing from Moroc­co, our clos­est Mus­lim coun­try. 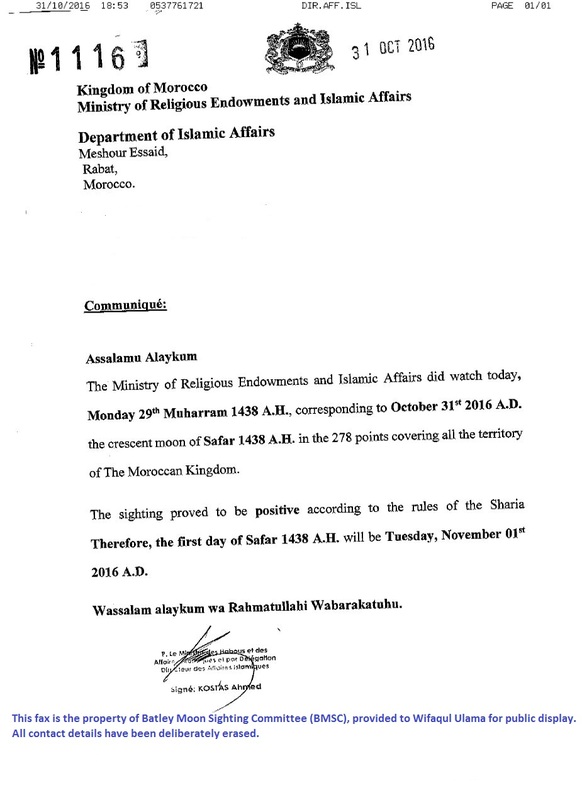 Wifaqul Ula­ma have there­fore decid­ed that 29 days of Muhar­ram will be com­plet­ed and Safar 1438 will begin from Tues­day, the 1st of Novem­ber 2016. This moon was also seen at La Rochelle (France). Moon was not sight­ed any­where in Britain or in our clos­est Mus­lim coun­try of Moroc­co. Wifaqul Ula­ma have there­fore decid­ed that 30 days of Safar will be com­plet­ed and Rabi­ul Aww­al 1438 will begin from Thurs­day, the 1st of Decem­ber 2016. This Moon was observed at Bay­onne on the 30th of Novem­ber (this for the record as it was not seen the day before). Moon was not sight­ed any­where in Britain or in our clos­est Mus­lim coun­try of Moroc­co. Wifaqul Ula­ma have there­fore decid­ed that 30 days of Rabi­ul-Aww­al will be com­plet­ed and Rabi­ut Thani 1438 will begin from Sat­ur­day, the 31st of Decem­ber 2016. Moon was not sight­ed any­where in Britain or in our clos­est Mus­lim coun­try of Moroc­co. Wifaqul Ula­ma have there­fore decid­ed that 30 days of Rabi­ut-Thani will be com­plet­ed and Jumadal-Oola 1438 will begin from Mon­day, the 29th of Jan­u­ary 2017. This Moon was observed at Cler­mont-Fer­rand on the 29th of Jan­u­ary (this for the record as it was not seen the day before). Moon was sight­ed Moroc­co, South Africa and by two indi­vid­u­als in Britain. 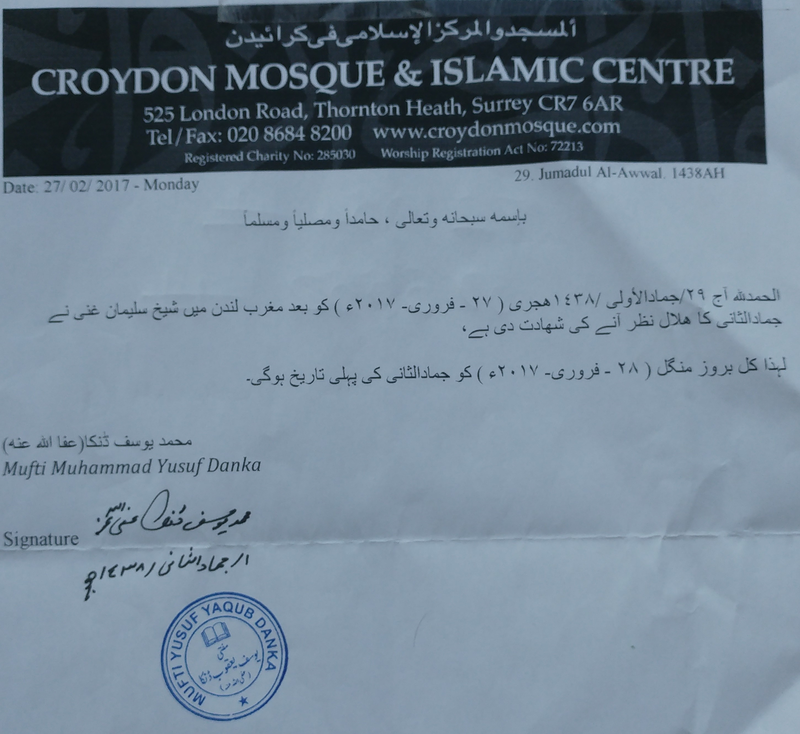 The tes­ti­mo­ny of Shaykh Suli­man Gani (DB) was ver­i­fied by Croy­don Mosque. Wifaqul Ula­ma have there­fore decid­ed that 29 days of Jumadal Oola will be com­plet­ed and Juma­dat-Tha­nia 1438 will begin from Tues­day, the 28th of Feb­ru­ary 2017. Moon was not sight­ed any­where in Britain or in our clos­est Mus­lim coun­try of Moroc­co. It was also not sight­ed in South Africa. Wifaqul Ula­ma have there­fore decid­ed that 30 days of Juma­dat-Tha­nia will be com­plet­ed and Rajab 1438 will begin from Thurs­day, the 30th of March 2017. We have not received ver­i­fi­able news of Moon being sight­ed any­where in Britain and we have been unable to scru­ti­nise the news on the Inter­net. Moon was sight­ed in our near­est Mus­lim coun­try of Moroc­co. 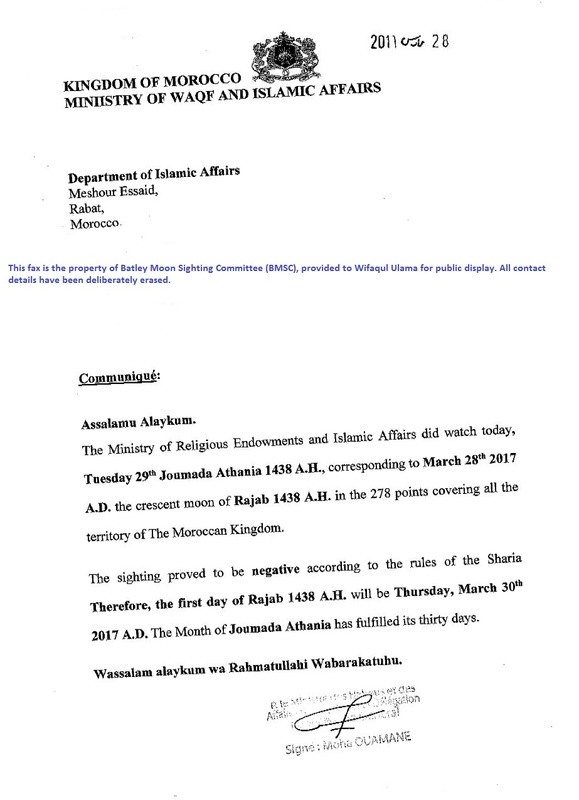 Wifaqul Ula­ma have there­fore decid­ed that 29 days of Rajab will be com­plet­ed and Sha’baan 1438 will begin from Fri­day, the 28th of April 2017. Update: A sin­gle tes­ti­mo­ny was received from Britain which was ver­i­fied and authen­ti­cat­ed by Wifaqul Ula­ma. It was received late. None of the oth­er sight­ings being cir­cu­lat­ed on the Inter­net were sub­mit­ted to Wifaqul Ula­ma or Bat­ley Moon Sight­ing Com­mit­tee to ver­i­fy and authen­ti­cate. Moon was not sight­ed any­where in Britain. 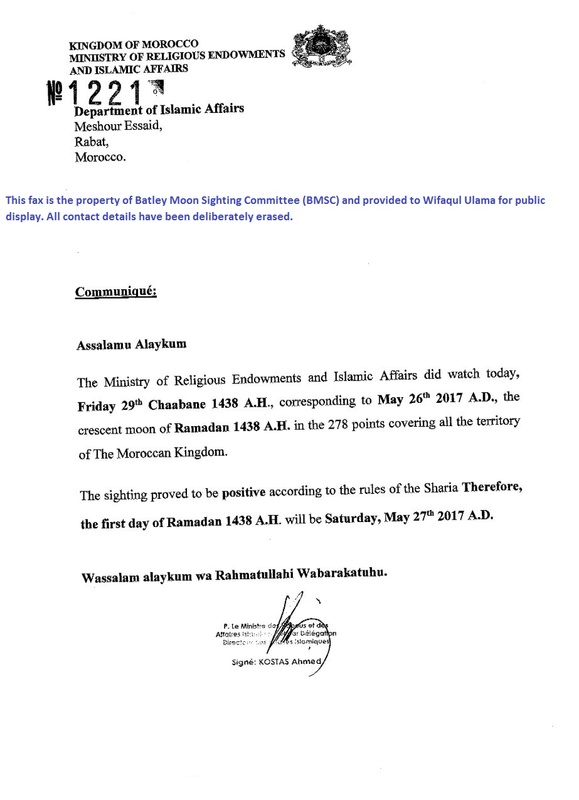 How­ev­er, we have received cred­i­ble and ver­i­fied news of Moon Sight­ing from Moroc­co, our clos­est Mus­lim coun­try. 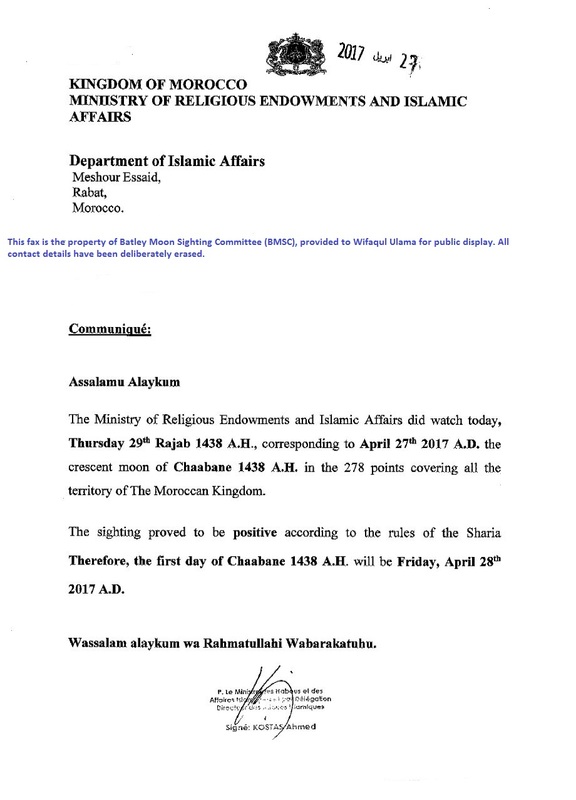 Wifaqul Ula­ma have there­fore decid­ed that 29 days of Sha’baan will be com­plet­ed and Ramadan 1438 will begin from Sat­ur­day, the 27th of May 2017. This Moon was observed at Paris on the 26th of May (this for the record as it was not seen the day before). Moon was not sight­ed any­where in Britain. Moon was also not sight­ed in from Moroc­co, our clos­est Mus­lim coun­try. Moon was also not sight­ed fur­ther away in South Africa. Wifaqul Ula­ma have there­fore decid­ed that 30 days of Ramad­han will be com­plet­ed and Shaww­al 1438 will begin from Mon­day, the 26th of June 2017. Moon was not sight­ed any­where in Britain. How­ev­er, moon was sight­ed in Moroc­co, our clos­est Mus­lim coun­try. 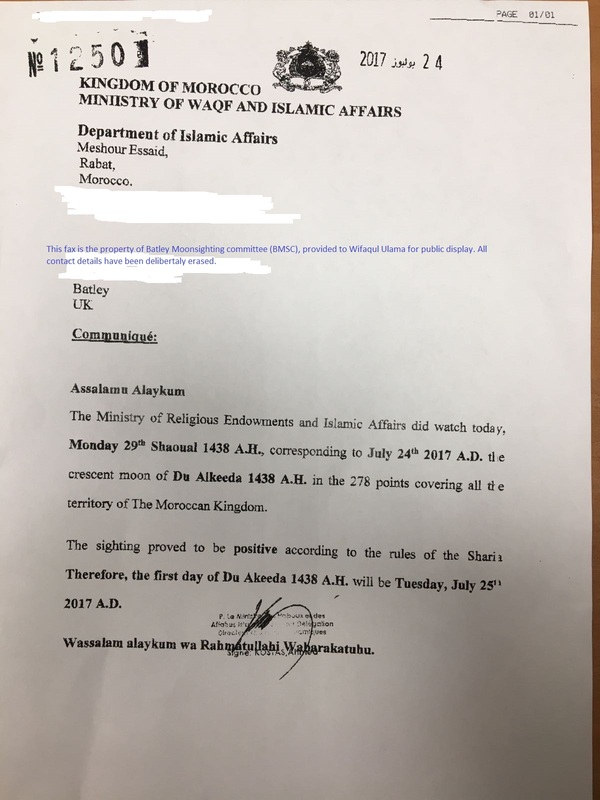 Wifaqul Ula­ma have there­fore decid­ed that after 29 days of Shaww­al, Dhul-Qa’dah 1438 will begin from Tues­day, the 25th of July 2017. This Moon was also seen at Toulon (France). Moon was not sight­ed any­where in Britain. How­ev­er, moon was sight­ed in Moroc­co, our clos­est Mus­lim coun­try. 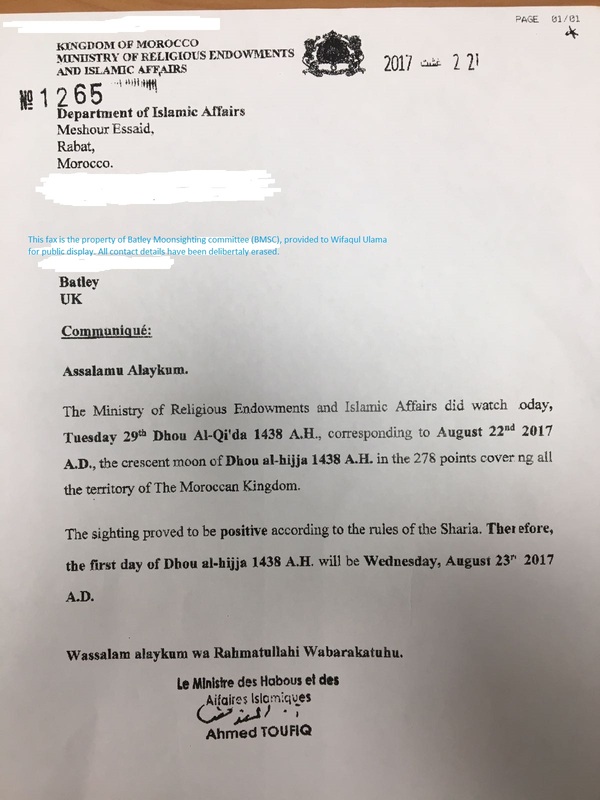 Wifaqul Ula­ma have there­fore decid­ed that after 29 days of Dhul-Qa’dah, the month of Dhul-Hij­jah 1438 will begin from Wednes­day, the 23rd of August 2017.